Mt. Pico, the tallest point in the Atlantic Ocean. Within the past 2 years, archeologists from the Portuguese Association of Archeological Research (APIA) have identified archeological evidence on the Azorean archipelago that supports their belief that human occupation of the Azores predates the arrival of the Portuguese by many thousands of years, possibly even of a Carthaginian or even Atlantean civilization! Project AM47 has been writing to this effect since 2007, with the Azores being the Point of Alchemical EARTH in a globally psycho-cosmic structure of sacred geometry… and now it’s a reality!! This entry was posted on September 21, 2013 at 3:26 pm and is filed under Disclosure, History. You can follow any responses to this entry through the RSS 2.0 feed. You can leave a response, or trackback from your own site. Pyramids here, pyramids there, pyramids damn near everywhere. What were they used for? Was it part of a planet grid for world wide communication, shamanic spirit travel, homing structures for dimensional teleportation, psycological and physcial healing tools or maybe all of those and more. They aren’t that esoteric. What a pyramid IS technically is a perfect ‘Resonator Sink’, or an ‘Antenna Sink’. Nothing much more elaborate than that. Anyone that has studied Acoustics 101 will get it immediately. That’s why all true pyramids emit an electrostatic column through their apex. Simply put, they collect ambient electrostatic charge from the surrounding atmosphere, and discharge the result through their apex. Which means they are natural Electrostatic power generators. How that energy was collected or used is not known, but that doesn’t mean they are not exactly what they replicate. My father was forn in the Azores and I have always been very curious about the area since there is very little written about it. It seems that pyramids are being located all over the world. Makes one wonder what this is all about? Always very interested to hear of these new discoveries. Reminds me of some of out explorers and astrologists in history being ridiculed or worse for trying to say the earth was round. Would be so nice to see main stream academia sing onto some of this and other discoveries. Come on people, you know that Sphinx is more than a couple thousand years old! If you search Earth Keeper Chronicles, AA Metatron describers the 3 pyramids off the coast of Texas in the Gulf of Mexico. If you search on Youtube, there is video about a crystal pyramid off the East Coast of the United States, east of Virginia Beach, VA or North Carolina. This has been independently confirmed by a European undersea research group. The biggest one I have learned about is the Bosnian pyramid. We were never taught about it in school, and it cannot be denied that it exists, because it is above ground, and being excavated as we speak. Share the truth with the world- we have a right to know our true history. Finally, search Tibetan monks using sound technology to levitate and move heavy stones. It was witnessed and documented by a European man. I’ve dreamed of Pyramids all my life and I was overly fascinated with Egypt and Atlantis. According to this report, this pyramid was found on my birthday 9-19. I feel this is leading to evidence of a super global civilisaton that flowered prior to the last ice age, and although conjecture on my part, I beleive this world-wide empire seeded Atlantis and utilized geo-thermal energy from the Earth’s core and or mantal, and more. I also think it worth looking at locations such as Hurd Island, a gut feeling. This discovery is bound to open the floodgates and let’s see National Geographic and others open this right up! According to the graphic in this article the pyramid peak lies 136 feet below the water, extending downward to 360 feet at the base. That’s makes the part of the structure extending above the sea floor 224 feet tall, roughly 75 meters. That’s significantly more than the 60 meters given in the article. 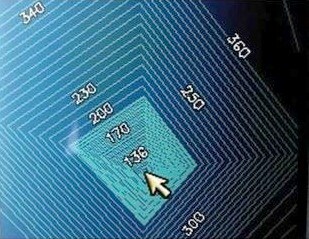 Now, if this structure is found to be a part of Atlantis and we’re to trust the readings of Edgar Cayce (which I do), this pyramid has been under water for at least 12,000 years. How much sediment accumulates in that time, and how much further below the sea floor does this pyramid extend? We don’t know what these pyramids were “for” because they did something that we don’t know how to do (or that we can do). Chris Dunn’s interpretation based on the Great Pyramid at Giza, is that a pyramid is a “coupled oscillator”. They use the natural hum of the Earth to start and sustain their mysterious function. Pyramids were placed on the earth in groups replicating specific constellations, usually from the Taurus constellation. Then, the beneficial emissions from the constellation are received in the pyramid field. It is the same as radio frequency transmission, where the receiving antenna is an analog of the transmitting antenna. Wayne Herschel discovered this ground pattern after Robert Bauval published the Giza Orion Correlation Theory. Have you seen the map of Atlantis that Christian O’Brien (The Shining Ones ISBN 0-946604-20-7) constructed from the undersea topology of the Azores? I wonder where this pyramid would fit into that? I have always found ancient history fascinating! This pyramid is at one of the apexes of that great triangle having other two at Mt. Kailas and Mt. Meru that is known as the peak in Greenland. The Greenland peak was the place where the North pole was before asteroid cataclysm. Objective History [Russian] gives details of ancient triangulations/ Geodesy. The ancient epics of religions the world over give clues to such paleo history finds.